I know I’m a bit belated in posting updates about my son’s NAET journey. I suppose that’s because our life gets so chaotic and crazy sometimes. It’s just par for the course really with my spectrum kiddo mainstreaming kindergarten and an eighteen year old beginning his college journey. Oh, and we can’t forget about our fifteen year old beginning his sophomore year of high school either. We’ve had back to school fun, the subsequent illnesses that always seem to follow returning to public classes, and an extremely hectic workload for the past few months. I’ve got a running list of social stories to write (needed as of yesterday) as well as many issues to vent about in our world. Today, I wanted to focus on happy, so this update seemed most fitting. Greater understanding of family relationships: Understands that he has cousins and that these are the children of his Aunts & Uncles. Improved conversation and less wary of people he doesn’t know. Even striking up conversations with strangers in stores and restaurants now. No longer screaming in protest if I join him in a song or dance. In fact, we recently sang a song together for the first time after his third treatment. Keratosis pilaris rash on upper arms is nearly gone. Bump under right eyelid is much smaller as well. Increased joint attention and interest. Improved patience, flexibility, and waiting. Better able to understand verbal explanations without visual aids. Better control of sensory overload – particularly hand dryers in bathrooms. These used to result in W running, screaming, and crying. Now he’s able to cover his ears with his hands and tell me he doesn’t like the hand dryer. Requesting play frequently – wanting to engage in imaginary play more often with greater flexibility. Increased eye contact – especially when requesting something he wants – almost to a comical point. Improved awareness of his surrounding environment and better reading comprehension. Better able to cope with crowds and social events. 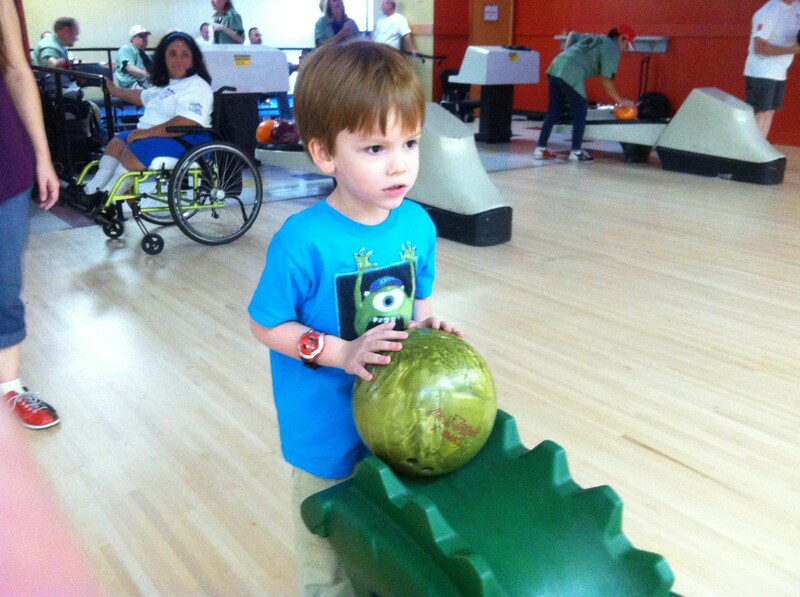 W is an Easter Seals Ambassador and attended their family bowling bash last Saturday. We were shocked with how well he handled the boisterous loud event. He was a social butterfly shaking hands, answering questions, and even hugging strangers that work with the Easter Seals. I am still amazed at how well he handled the entire event & we also learned that W really enjoys bowling of all things. I think we have some family bowling outings in our future, for sure. I’ll finish this update with a cute story about a book we were reading a month ago before bedtime about the Octonauts and the Frown Fish. There is a part of this story, where the main characters decide to have a costume party and they all dress up in various costumes. One of W’s favorite characters, Captain Barnacles is dressed in a Hamlet costume. I’d never mentioned this to my son – instead we often focused on the more easily recognized costumes like pirates, princesses, and fairies. W likes to assign agent names to the characters on this page for fun. Each agent name is formed with the first letter of their name, or in this case, their costume’s name. When he pointed to Captain Barnacles, he stated and there’s Agent H. I said H are you sure? W’s response was, “Mommy, because Captain Barnacles is wearing a Hamlet costume.” I asked him how he knew about Hamlet and he told me, “You know, that guy Shakespeare. I know about him. I know some things.” Now, I can assure you that we’ve never discussed Hamlet or Shakespeare, but this simply blew my mind. He looked me dead in the eyes for the entire conversation as well. I’m looking forward to continuing our NAET journey. So far, I’m amazed with all the positive change my son has experienced and will continue on this path as long as it provides benefits. If you’re interested in learning more about NAET yourself, check out the research study led by Dr. Jacob Teitelbaum on Improving Communication Skills in Children with Allergy-related Autism Using Nambudripad’s Allergy Elimination Techniques. This is absolutely marvelous! What a gorgeous little boy he is, too. I’ll share your blog and hope it’ll be taken up by other people. Congratulations to you all and all good wishes for the future. Thank you! We are thrilled with the results we’ve seen from NAET and although I can’t fully explain how it’s working (at least in a manner that today’s conventional M.D. would accept) I can say that the proof is right before my eyes. I’ll be posting another update soon with more progress to report! I hope that others research this to determine if it might be a good fit for their ASD children. Hello, thank you for blogging about your experience with NAet. We are sitting on the fence about the treatment for our autistic boy mostly because he doesn’t seem to have allergies to begin with. Also our nearest practitioner is a 5 hours drive away from us.. we would really appreciate if you can share how your son is doing now. I would appreciate if you prefer to mail me too. Thank you so much. I am happy to share our experiences with you. I know that I am long overdue for some updated posts. Life has gotten chaotic as it gets. 🙂 I will try to respond to you direct through email and will work on writing an updated post for the blog as well. NAET has worked some wonders for us and I’m doing as much as we can afford. I wish you the best of luck if you do decide to try it. I am interested in hearing any update you have to offer.